Your organization is likely to have materials to hand out to dozens of employees. Let’s say you’re forming a new department, and want to provide all new team members with the department policies. Or, you need to onboard new-hires, and quickly familiarize them with your company’s sales techniques. Or, you have classroom materials to share with your students. If your content is an ordinary PDF or Word (DOC) file, or a PowerPoint presentation, you can send it by email, or share on a corporate network. However, how do you make sure that all the employees study these files? You can do it with iSpring Flip and a learning management system (LMS). 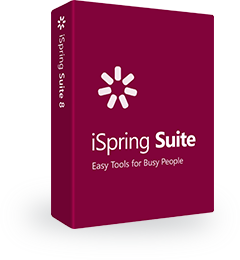 iSpring Flip is an easy-to-use tool which converts traditional documents into HTML5 e-books. Basically, these e-books are e-Learning courses and support e-Learning standards. You can upload them to your LMS and keep track of how many pages each of your employees has read. Making e-Learning longreads with iSpring Flip is pretty simple: you just select a PDF, Word, or PowerPoint file, click on Publish, and voila – your e-book is here! Now it’s ready for uploading to an LMS. The LMS reports will show who read your files and how far have they progressed. You can flip through pages of an e-book exactly the same way as with a real printed book. All fonts and images are crisp and clear with any screen resolution. If there are links to external files, or navigation elements in the original file, they work after publishing to HTML5 as well. With e-books, your employees can stream learning on their phones, tablets, and iPads any time in the field, in their cars, or on a plane. Plus, the longreads are available even offline with a free mobile app. The app collects reading statistics offline, and sends them to an LMS as soon as the phone is back online. Download and install iSpring Flip. Open iSpring Flip, and select a file which you’d like to convert into an e-book. Please make sure the file is not open in any other application at the moment. Before publishing, you can check how an e-book will look on mobiles or tablets. Just click the Preview button, and switch between two modes. Click on Publish, and select a destination. You can publish your file for an LMS, convert it to HTML5 format for sharing on the web, or upload it to iSpring Cloud, a specialized cloud storage and sharing service. If you publish to HTML5, you can upload your e-book to a server, and then embed it into a website or blog. Note: Select Use iSpring Play before publishing; this will allow your viewers to open the e-book in the mobile app and read it offline. If you want to share your e-books with minimum effort, then publish them to iSpring Cloud. The content will be uploaded from iSpring Flip directly to your personal storage, so you can easily share it. Just paste and send a short link to your presentation anywhere, or paste the embed code into the HTML code of your webpage. The e-books will be played seamlessly on any device. If you’re going to publish your file for an LMS, select the format which your LMS supports. iSpring Flip supports all modern e-Learning specifications: SCORM (2004 and 1.2), xAPI (Tin Can), Blackboard, cmi5, and AICC. Don’t forget to check Zip output. The output ZIP package is ready for uploading to your LMS. Create a new assignment and invite your learners to read the e-book. You can track their activities page-by-page and evaluate overall progress with LMS reports. Now, it’s time to roll up our sleeves and put this theory into practice with iSpring Flip.